Glucomannan: A Weight Loss Miracle or Just Hype? With the global obesity scores crossing 2 billion, everyone is looking for a quick fix to lose weight (1). While a lot of supplements and products are advertised to work like magic but the results are often disappointing. One supplement that might help you achieve your weight loss dreams is Glucomannan. Derived from an Asian root, Glucomannan is already making its way to the Western market and now being sold as a weight loss supplement. So what is glucomannan, does it really help with weight loss, what are the risks of its use? This article will answer all these questions plus will explore the potential of this prebiotic fiber in promoting weight loss and the health as a whole. So let’s get started. Konjac, or the elephant yam, is a dark purple plant native to the tropical areas of the eastern Asia. It has been a part of the Japanese cuisine for several centuries. The roots of this plant are dried and the material obtained is called Glucomannan. Chemically, glucomannan is a polysaccharide that is naturally found in the cell walls of the plant cells. It falls into the category of prebiotic fiber that undergoes minimal digestion in the gut. Moreover, it can absorb water 50 times its weight, making it one of the most viscous dietary fibers known (2). In fact, it is so viscous that if you were to empty one capsule of glucomannan into a glass of water, the whole glass would turn into a thick gel. How does glucomannan kick start the weight loss process? While researchers are still trying to figure the exact mechanism of how glucomannan works but here are the top 7 ways glucomannan might work to help you lose weight. No matter what you do, the entire weight loss struggle comes down to calories in and calories out. Anything that has low-calories is favorable for weight loss. When it comes to glucomannan, this prebiotic is extremely low in calories. A single tsp. of glucomannan powder has 10 calories in it (3). But the good thing about these calories is that all of them come from a non-digestible dietary fiber. In other words, your body is not able to absorb these calories. One effective weight loss strategy is appetite control. Anything that could curb your appetite would help you lose weight too. Same is true for glucomannan as well. When you eat glucomannan, it swells up on reaching your stomach and the intestines. This gives you a feeling of fullness and you do not feel like eating. Another aspect of the appetite controlling properties of glucomannan is its effect on the hunger hormones. Your hunger is under the influence of two main hormones: leptin and ghrelin. Leptin induces a feeling of fullness, reduces food intake, and promotes weight loss. Ghrelin, on the other hand, is a hormone that plays a key role in key meal initiation (4). So when you are hungry, your ghrelin levels go through the roof and you can’t stop eating. Researchers at the Mahidol University, Bangkok discovered some amazing effects of glucomannan on ghrelin levels. They discovered that glucomannan reduced ghrelin levels both in acute and long-term settings. When given with meals, a 1-g capsule of glucomannan reduced serum ghrelin levels to 30% lower than the baseline levels within 2 hours. Moreover, the basal levels of ghrelin reduced significantly when measured 4-weeks following supplement intake (5). Your gut is the main site where the nutrition from your food gets absorbed. The sooner the food leaves your stomach and reaches the intestine, the sooner its nutrients get absorbed. In one research, scientists studied the effects of fiber supplementation on the gastric emptying time. Interestingly, it took the food 186 minutes to reach the intestine when no fiber was added. It was in comparison to 232 minutes when fiber was added to the meals (6). Same principle applies for glucomannan too. Since it is a highly viscous, non-fermentable fiber, it slows down the rate of transition of food from your stomach to the intestine. This makes the food stay in your stomach, which makes you feel full for longer periods. When you eat some food, the sugar from that food gets absorbed from your gut and makes way to your system. That’s when insulin springs into action to lower the levels of this sugar. One of the several ways insulin deals with excessively high levels of blood sugar is by shunting the body sugar into fat storage. Other nutrients from food that increase the risk of fat deposition and weight gain are fats and cholesterol. Research shows that viscous fibers decrease the rate of absorption of nutrients, including sugar, fats, and cholesterol, from the gut (7). Limited absorption of these nutrients means only a small percentage of these nutrients making way to the fat storage. While the actual research on this property of glucomannan is limited but theoretically this is a way glucomannan could help you lose weight. Your gut is home to trillions of bacteria, which are termed as the probiotic or ‘good bacteria’. Fibers, like glucomannan, serve as a fuel for these probiotic bacteria. In other words, the probiotic bacteria thrive in the presence of these prebiotic fibers. Is There Real-Life Scientific Research That Could Support All These Claims? The potential of glucomannan sounds promising, at least on the paper. But is there actual scientific evidence that glucomannan speeds up weight loss? Well, there are several problems when it comes to the glucomannan research. Most of the research done is not of good quality. The potential of glucomannan in promoting weight loss has not been studied in large studies. The studies available so far are mixed and not enough to draw conclusive results. But still, here are some studies that study the potential of glucomannan in helping with weight management. This research was conducted at the University of Tromsø, Norway. The purpose of this study was to compare three fiber supplements for their effects on weight reduction (9). The participants were divided into three groups based on the type of fiber supplement they ate: glucomannan, glucomannan plus guar gum, and glucomannan plus guar gum and alginate. In addition, all three groups were given a low calorie (a 1200-calorie) diet. At the end of 5 weeks, all groups lost weight but none of the fiber types proved to be superior in its weight reduction potential. All the groups lost weight at a rate of 0.8 kg/week. Another study comprising of 53 obese participants evaluated the capacity of glucomannan to promote weight loss (10). The participants of the study were randomly divided into two groups: they either received a 1.33-gram glucomannan supplement or a placebo. At the end of 5 weeks, the changes in body weight were noted. Unfortunately, the two groups did not differ much in their body weight after 5 weeks. This study is basically a meta-analysis that sums up 13 other studies based on the health benefits of glucomannan (11). The results of this meta-analysis show that the users of glucomannan can expect up to 0.80 kg reduction in weight with its use. This study was based on 20 obese participants. The participants were given a 1-gram glucomannan supplement pill or placebo 1 hour before their meals (12). They were asked not to change other dietary patterns. At the end of 8 weeks, the glucomannan group lost 5.5 lbs. weight compared to the placebo group in which the weight loss was not significant. Is it Meant for Weight Loss Only? Constipation: Being a non-digestible fiber, glucomannan could help you with constipation (13). Blood sugar: There has been some preliminary evidence that the use of glucomannan might be helpful in reducing blood sugar levels in type 2 diabetics (14). It can cause up to 8 mg/dl reduction in fasting blood glucose (11). Beware of These Side Effects While Using Glucomannan! Risk of choking: Glucomannan swells up when it comes into contact with water. It is supposed to happen when it reaches your stomach. But if that happens in your throat, it could lead to serious choking. You should immediately drink 1-2 glasses of water to wash it down. However, you should rush to your healthcare provider if the condition does not improve on its own. Drug interactions: Observe caution while using glucomannan with sulfonylurea or anti-diabetic drugs. Is glucomannan effective in promoting weight loss? Probably yes. Can you expect wonders with its use? Probably no. 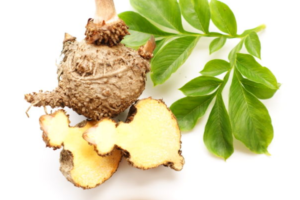 Although the preliminary results are promising but none of the available studies has reported a significant reduction in weight with the use of glucomannan. The bottom line is that it is quite unlikely that glucomannan would be of huge benefit if taken alone. However, when combined with a well-balanced diet and active lifestyle, it may be helpful in accelerating weight loss.